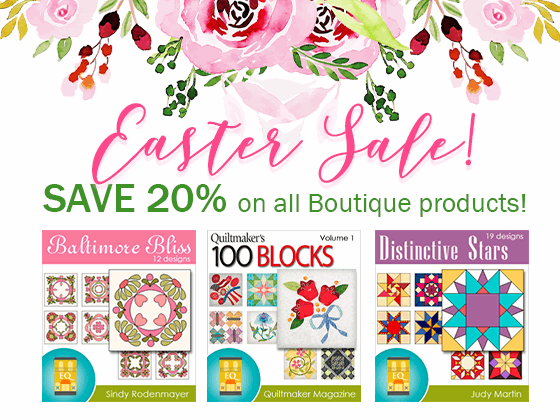 20% off on EQStitch and add-ons! Spring Cleaning Scrap Challenge – Winners Announced! First, we’d like to thank all the participants in our Spring Cleaning Scrap Challenge! We were overwhelmed with all the talent! For this reason, we decided to give away not one, not two, but THREE prizes! Click here to see all the entries and challenge details. Thanks again to all the participants! Stayed tuned to the blog and sign up for our newsletters to find out about future challenges. Winners: Please look for an email from me so we can get your prizes to you! So many great entries…I am humbled. Thank you very much! Great designs by the winners, and to the recipients of the Honorable Mentions – CONGRATULATIONS to !!! Great Job! Both to the Winners, Honorable Mentions and the contest crew! Well Done…. They are all wonderful, but I am in love with Anne Maundrell’s quilt – LOVE the design, the fabric choices & especially the quilting! Love all of them but especially Jerriann Massey’s Scrappy. Will she share the EQ7 project file. I’d love to use this for community quilts for our guild. All you have to do is download the Scrappy 20×20 and color it in! I also LOVE Jerriann Massey’s Scrappy and would love to have a copy of the file if she’s sharing it. Thanks. It was THE BEST!!! They are all great but really like Jerriann Massey’s Scrappy. Love the colors and the design, WOW! Would also like to have a copy of the file if she is sharing. I love the one with the embroidery designs in the center of the stars. Great thought to add those! Kudos!